Chris Kahl is a native of the Florida Space Coast, just miles from the Kennedy Space Center. He began performing around Central Florida in the late 1990s and released his self-titled debut to rave reviews by the Florida Press. His song “Bring Us Together” was featured in regional television ads. He graduated from Rollins College and moved to London for a few years where he played clubs and the London Underground, toured the UK, Ireland, and Germany, and performed live on British TV and radio. After returning to Florida, Chris released his album Orange Blossom Memories, a nostalgic ode to his home state. His song “Floridiana Hotel” was hon-ored as one of the Top New Florida Songs of 2006. His song “Out on Cedar Key” from his album Sun-shine Kid (2009) won the Will McLean Florida Song-writing Contest. 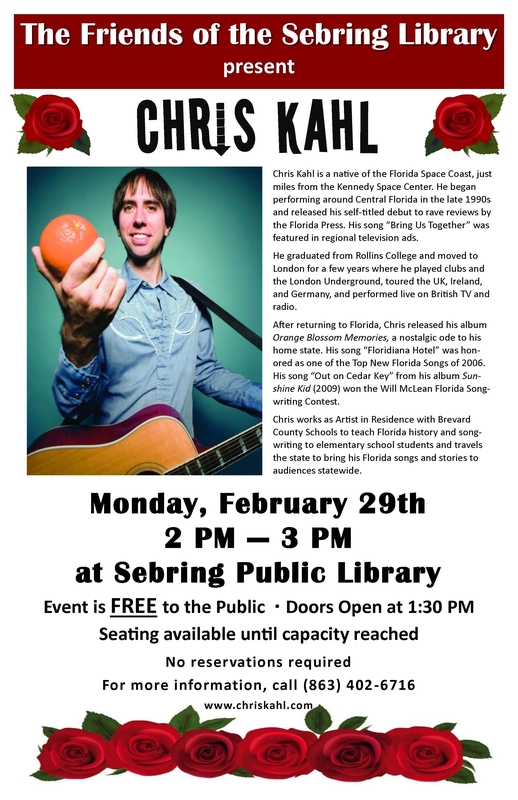 Chris works as Artist in Residence with Brevard County Schools to teach Florida history and song-writing to elementary school students and travels the state to bring his Florida songs and stories to audiences statewide.